Here’s a good example of what might be called the serendipity of inspiration. Miss Una Frances was inspired by a portrait of the Duchess of Alba, painted in 1795 by Francisco de Goya y Lucientes. A photo of this portrait appeared in Antiques magazine, in an article about an exhibition of Spanish Art in Dallas, Texas. I have no idea how large the real portrait is, nor do I know how large the real Dutchess was, although she is quite beautiful and tiny-waisted. Miss Truman is not intended to look like the Duchess, who simply appeared to me as though she could have been a doll. Eighteen inches tall, Una has mohair hair, is wearing the same lovely long white dress and slightly fewer of the astonishing number of red accessories that the Duchess sports. She is also missing her tiny white dog, now that I see it….. I felt no compunction to name her after the Duchess, and her name is a result of the same process I use with all my dolls: the names just come to me. 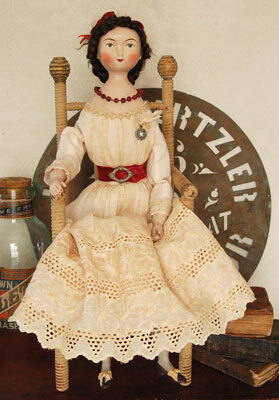 Miss Truman is available for sale in my Etsy shop, LoraSoling Handmade, where you can find out more about her.